Let’s hear it for craft — that often neglected or outre skillset that when in perfect working order, can turn a fine rhinestone into a glittering diamond. ”daring concepts” are supposed to be enough, where the dramaturgy is simply sloppy, and where you feel no one dared to challenge the script on behalf of the audience. Ah, craft, wherest art tho? 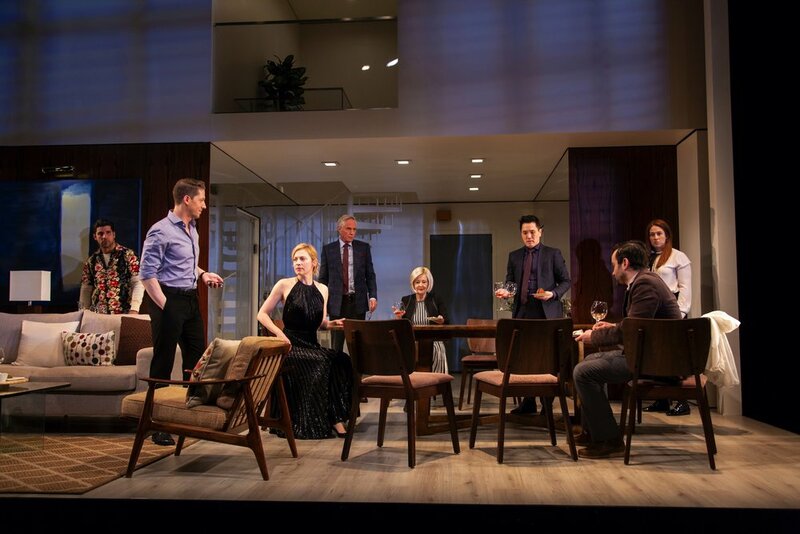 At Hartford Stage, that’s wherest :”The Engagement Party” is playing and which had me thoroughly engaged and engrossed through the final seconds of the fast-paced 85 minute production,. In a swank Manhattan apartment — and Alexander Dodge has created yet another jaw-dropping, Rubic’s Cube of a set that turns as often as the plot — a young handsome couple are having an engagement party. He has worked his way up from a working class ‘hood. to become — in Tom Woolf’s world, one of the Wall Street “masters of the universe.” She is the beautiful daughter of a Wasp-y, snobby financier and an everything-is-wonderful wife. They arrive first, along with their closest friends with various histories to each other.. Loyalties are challenged, doubts are raised, histories resurface, and morals are questioned . And yes, there is a wonderfully satisfying conclusion. And there’s not a loose end in sight. Sure, some of the characters — especially with the zippy, intermission length — could use more detail, coloring, history: in fact all of the female characters need to be give a bit more,,, especially since this production is sure to move on — and should. There’s not many shows such as “The Engagement Party” that gives an audience so much pleasure in being unnerved, that plays with our expectations, that teases, taunts and yet still ultimately deliver the goods. With a splendid cast, top-notch production values and writing that is so masterfully done, I cannot imagine this play not becoming the new classic of its kind.